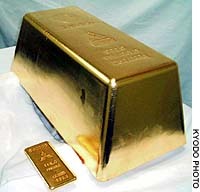 Mitsubishi Materials Corp. said Thursday it has made the world’s largest gold bar, weighing 250 kg. The gold bar, valued at 400 million yen, measures 45.5 cm by 22.5 cm at the base and is 17 cm high, the firm said. The nonferrous-metals maker has filed for a Guinness Book of Records listing. In response to a report of a 220-kg bar made in Taiwan late last year, Mitsubishi Materials made the larger bar to demonstrate its technology, the firm said. The gold bar will be put on display beginning July 11 at a tourist facility in Izu, Shizuoka Prefecture, it said.